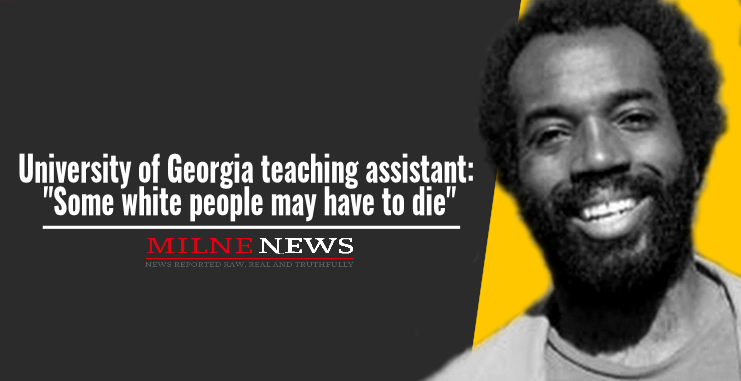 University of Georgia teaching assistant: "Some white people may have to die"
A teaching assistant at the University of Georgia who constantly attacks the concept of “whiteness” on social media took it up a notch on Wednesday when he said that “some white people may have to die” in order for black people to advance. “Some white people may have to die for black communities to be made whole in this struggle to advance to freedom,” UGA philosophy TA and Ph.D. student Irami Osei-Frimpong wrote in a now-deleted comment on the Overheard at UGA Facebook page, Campus Reform reported. Despite receiving a lot of backlash on social media for his comments, Mr. Osei-Frimpong continued to attack “whiteness” and the what he calls “trolls” who disagree with him on Friday. Osei-Frimpong has a habit of attacking “whiteness” and this isn’t the first time that he has suggested that “some white people” might need to be killed. In a post on Medium he wrote, “We had to kill some white people to get out of slavery. Maybe if we’d killed more during the 20th century we still wouldn’t talk about racialized voter disenfranchisement and housing, education, and employment discrimination. Andrew Lawrence, who’s a conservative who has graduated from UGA last month, posted a video of himself confronting Mr. Osei-Frimpong the classroom about his past statements, and now he’s demanding that the university take action against the TA. In response to Mr. Lawrence’s video the university in a tweet said the views Mr. Osei-Frimpong expressed in his personal capacity do not reflect the views of the university. Mr. Lawrence told The Washington Times that the exchange took place in September, but he held onto the video and only posted it now because he was “afraid” of the potential backlash. Now, he wants the university to do what he thinks is right.